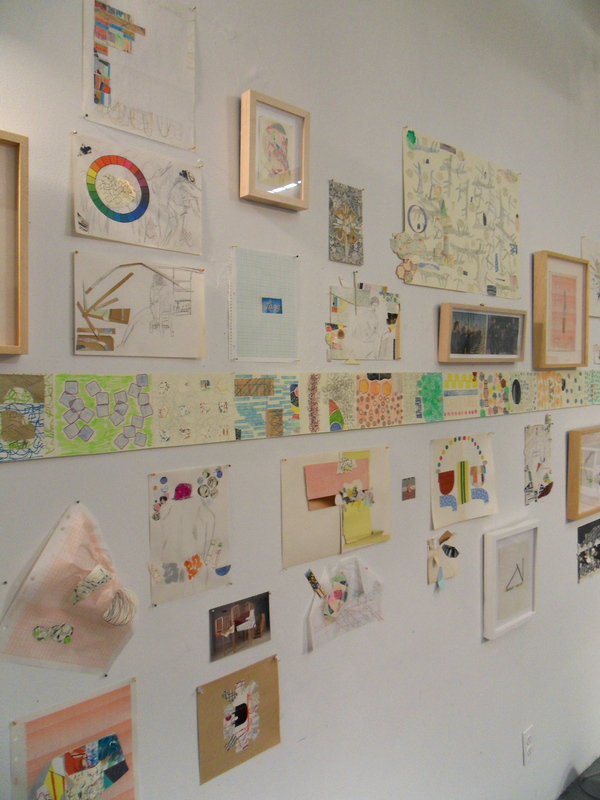 After an open studio in October, Austin Thomas left a number of collages pinned to the wall. As I drank hot tea in Austin Thomas’ studio in the midst of a blustery freak October snowstorm, dozens of colorful paper collages transformed the artificially-lit, windowless Manhattan space into a cozy nook with the warmth and optimism of a clever gingerbread house. I knew before meeting her that Thomas once ran the gallery Pocket Utopia and its summer camp, and that she also works on sculptural, site-specific pieces. I wondered whether this small space had lead her creative output toward smaller-scale projects. Alongside the collages hung an inspiration board, a real-life Pinterest of photos, sketches, objects and architectural renderings under plexiglass. All of these were the driving force behind her in-process Plaza Perch, a gazebo of stainless steel. After receiving the commission from the City of New York Department of Cultural Affairs, Thomas commissioned renderings, built a prototype in wood, and hired a team near Gowanus to form the steel. It will be installed on Humbolt Street in Brooklyn, a gathering space–one that acts as a touchstone for interactions and departures–a community spot. Although paper is a unifying material, many of her collages include a variety of media: Thomas’ own drawings, some found objects and figurative collages, old books, graph paper. Thomas finds materials, such as sketches or photos, and makes art, including drawings and geometric designs. Many of these also come from her own “travel diaries,” little Moleskine notebooks that she carries around. These works might be made on a trip or in a café, on the fly as “anywhere, anytime art” that can be cut or ripped up and repurposed. Then she meticulously incorporates those pieces of art into collages, essentially incorporating the ‘great wide world’ into each object. In doing that, she embraces the studio as a place for assembly while the actual creation takes place in myriad locations. Mandala, a collage on paper (left), and an assortment of paper sketches and materials awaiting a second life as a collage (right). Thomas spoke of sending these objects back out into the world—by selling them, a topic that is often uncomfortable for artists to discuss but a necessary dialogue she undertakes—and of letting other ideas come back in their place. One of the pieces with a price tag was Mandala, a collage anchored by a piece of green-lined graph paper. Like a firework or a burst of confetti, bold organic paper shapes culminate in a mandala that swells into a paper rosette. Spinning into a vortex of red, blue, and black, the paper cut-outs rest on the stark green lines with delirious tension, breaking the grid and reaching off the page, lifelike, radiating energy. Thomas approaches these pieces ontologically, thinking about the life of the objects, about the kind of world she wants her art to go out into and about making it that kind of world. In taking this approach, a sense of community drives the work. Reflecting on the roles artists play in communities, we touched on the “DIY aspect” of the current era, which often incorporates the artist as “writer, curator, maker.” Thomas embraces these roles with a determined lack of boundaries between projects—the scale, medium, field, and audience are all wildly divergent—and she insists that all aspects of the works inform one another. I felt no compulsion to ask if there was a unifying message in all the works. In fact, I forgot to. The intimate nature of her collages reveals an artist who is comfortable with ideas of writing, making, and connecting, and the public works reveal a sense of fellowship and camaraderie with all those who encounter them. The underlying theme is personal yet public, gracious and inviting. Even the inspiration wall has an eclectic gracefulness, an assured nature of also being part of the work. From collages, perches, and sculptures to blog entries and Tweets, the facets of Thomas’ work operate like beams of the mandala—radiating in many directions, yet anchored and integrated as necessary elements of a lovingly curated career. 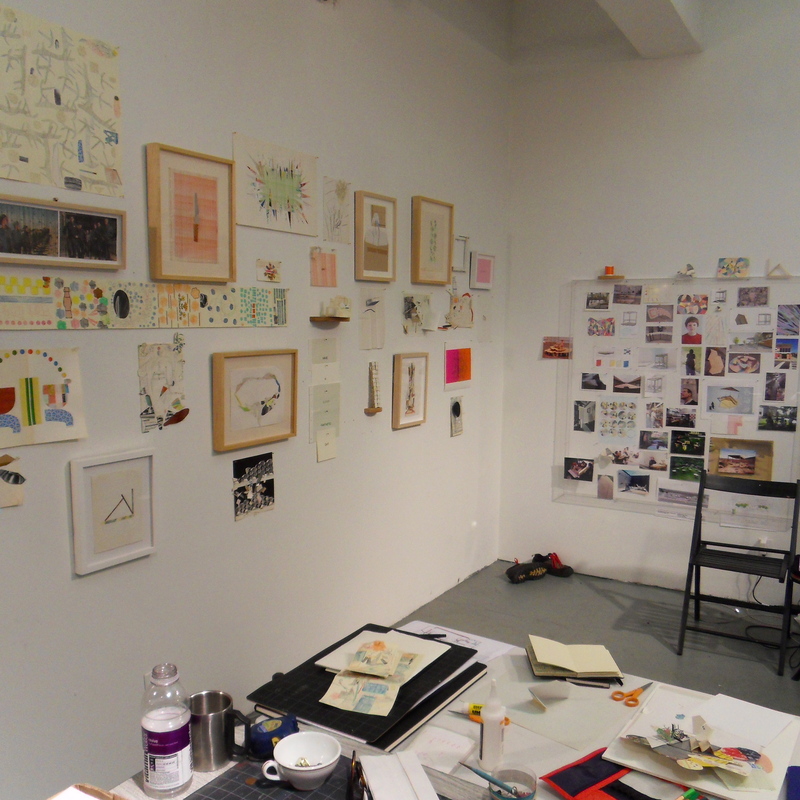 A table in the center of the space allows Thomas to work surrounded by finished projects (left wall) and inspiration for Plaza Perch (back wall under plexiglass). Loving After Vasari. You are so right that you can’t talk about one part of what Austin does without connecting it to everything else she does. Beams of the mandala indeed. great post, beautifully written and lovingly photographed. i can feel the warmth from here. thank you..! Thanks, Julie and Adam! It’s such a pleasure and an adventure to go on studio visits, and I truly appreciate when people come to this site to read about them.